I've been busy proofreading Classic Home Video Games Vol. 2, so I haven't had much time to blog, but I had to post this picture of my kids in their Halloween costumes. We had a great time trick-or-treating and visiting the neighbors. My wife's got the full report on her blog. 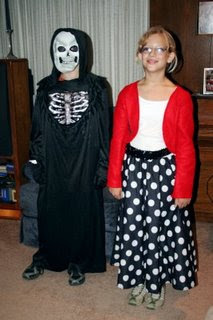 Ryan as a creepy skeleton (complete with oozing blood) and Katie as a cute '50s girl.